For an eatery with a French name, Garçon really has taken the concept of je ne sais quoi to a whole new level. How else then, to explain a menu that serves chorizo and congee and croque monsieurs for dinner? It’s a culinary “whatever” delivered with a cheeky grin, rather than a grunt and a shrug. In the face of menu-induced choice paralysis, the cheese and meats are an obvious choice. Our plate is filled with fine slices of locally-made chorizo and jamon serrano, and urgelia, a washed-rind cow’s milk cheese. The cheese is a little mild, a little nutty and far too easy to eat, especially with the side of delightfully piquant guindillas (long green chilli pickles). Now, onto the fried-things-to-eat-with-alcohol part of the journey. Jamon and manchego croquettes are molten, guilty pleasures (fried cheese balls will always be a yes) and I pop a bowl of school prawns like they’re hot. They’re crispy, whole-fried, and perfect with a squeeze of lemon and a cheeky dip in harissa mayonnaise. 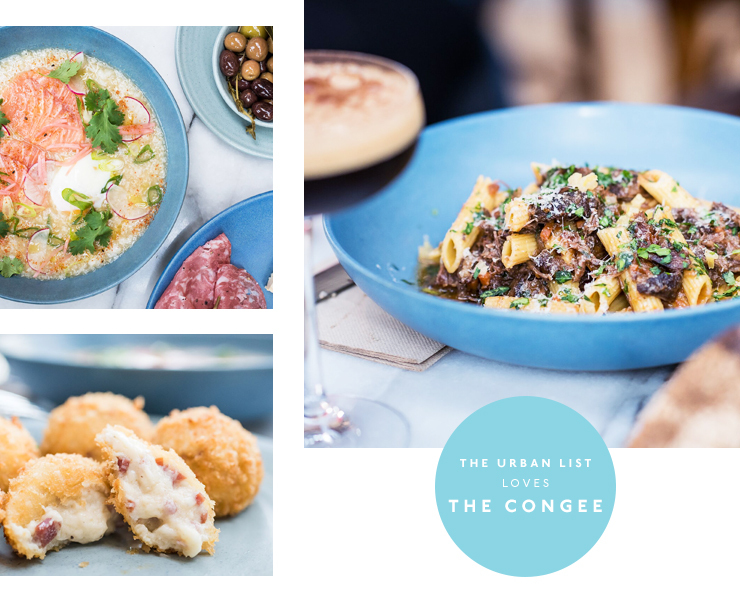 The congee, popular on the brunch menu, makes an unexpected appearance at dinnertime. It’s a happy mish-mash of Asian flavours—slow poached salmon, runny egg, radish, shichimi and fish sauce, all stirred into a smooth rice and quinoa base. After the fried-food lineup, it’s the cleansing, cholesterol-balancing dish your body needs. The beef cheek ragu is a pleasant meander back to Euro-territory, but we’re devastated to learn there is no dessert. There is, however, a section of the drinks menu dedicated to ‘coffee cocktails’. 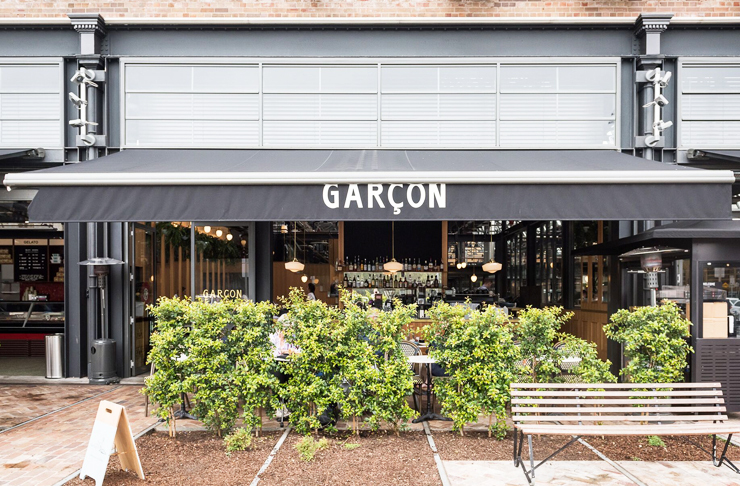 It’s a logical inclusion considering Garçon is joint-owned by Edward Cutliffe from Little Marionette coffee roasters and chef Brian Villahermosa (ex-MoVida). The desserts have deserted us, but a tiramisu cocktail hits the sweet spot. Garçon has some prime positioning at the front steps of the Tramsheds (note, the hype has subsided on the Harold Park food hall, which means—hello, personal space! I’ve missed you. The kitchen impressively dishes up brunch, afternoon tea and dinner, and the cocktails and coffee are shaken, stirred and steamed all day long. The alfresco seating, I’m conspiratorially told, is perfect for summer-sunset watching with a beer in hand. In the meantime, you can still head down to Garçon for a decent feed at most hours. Want to know what we thought of Fable Coffee? Read this.